Palestinian President Mahmoud Abbas is having a tough time grappling with reality in recent weeks. Ever since President Donald Trump declared Jerusalem as Israel's capital last month, Abbas continues to lash out and reveal his true colors. In a series of public statements since Trump's Jerusalem announcement, Abbas has propagated some fairly outlandish claims – even by his own, often radical, standards. In a Jan. 14 address to the Palestine Liberation Organization (PLO) Central Council, Abbas spent more than two hours ranting about the history of Zionism in a conspiratorial fashion. He claimed that all Jews moved to Israel solely for ideological and colonial reasons, not because of persecution "even during the Holocaust." 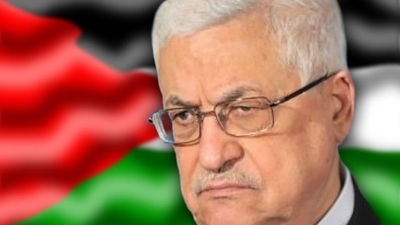 Abbas claimed to still support a two-state solution. But in the same speech, he went off on a blatantly anti-Semitic tirade that attempted to de-legitimize any Jewish presence in the state of Israel: "'The significance of Israel's functional character is that colonialism created it in order to fill a specific role; it is a colonialist project that is not connected to Judaism, but made use of the Jews so they would serve as pawns..."
These anti-Semitic comments are reminiscent of his Holocaust denying doctoral thesis, which harped on unsubstantiated relationship between Zionists and Nazis. Abbas' attempts to maintain a moderate image have been shattered. During his address, he repeated a libel claiming that "Israel is exporting drugs to us in frightening amounts" and targeting Palestinian society with narcotics in a bid to destroy it. This claim would be shocking if it was Abbas' first time making such ludicrous accusations. In the past, Abbas blamed Israeli rabbis for overseeing the poisoning of water wells in the Palestinian territories. The Palestinian president also called on Palestinians to continue "peaceful popular resistance." The problem is that the Palestinian Authority (PA) does not actually advocate for "quiet protest" through "peaceful means," as Abbas claims. Knowing the world would be watching, Abbas tried to put on a more moderate face when describing Palestinian "resistance." But this brief façade did not work. In reality, Abbas and the PA systematically promote violence and attacks against Israelis. The Palestinian leadership often uses the code word "popular resistance" in reference to individual terror initiatives – which has emerged as the norm in Palestinian terrorism recently. Abbas took his tirade to a new low and threatened U.S. President Donald Trump, saying: "May your house be destroyed." He even went as far as to insult U.S. Ambassador to Israel David Friedman and United Nations Ambassador Nikki Haley, saying that they "bring shame on the [U.S.] administration." Other Palestinian figures are now emboldened to escalate their war of words with the U.S. administration. Last week, the United States announced that it would withhold roughly half the aid originally allocated for the United Nations Relief and Welfare Agency (UNRWA) – a UN agency dedicated solely to serving the Palestinians. UNRWA-run schools in the Palestinian territories feature textbooks that demonize Jews and encourage Palestinian youth to embrace suicide terrorism. While insulting President Trump during his speech, Abbas exclaimed: "Damn your money!" President Abbas must have forgotten that the Palestinian Authority relies heavily on U.S. and European aid to survive. Yet under Abbas' leadership, a considerable and growing portion of that money goes directly to financing and encouraging terrorism, at the direct expense of societal development. Even before the Jerusalem announcement, Palestinian leaders were frustrated with President Trump, who warned Abbas last May to cease inciting violence and raised concerns over the PA's program of paying terrorists and their families. The latest crisis, however, has reached a new level. Palestinian leaders have refused to meet with American officials since President Trump's Jerusalem announcement. On Monday, Abbas snubbed Vice President Mike Pence, who was visiting Israel this week, meeting instead with European Union (EU) foreign ministers in Brussels as part of an effort to sidestep the United States as the main peace broker for the Israeli-Palestinian conflict. The Palestinian president tried, and failed, to pressure EU officials to immediately recognize Palestine as an official state. The next day, a White House official claimed that no other country "believes a US-led process could be replaced." But Abbas' frustrations are not only reserved for the United States. He accused Arab leaders of interfering in internal Palestinian affairs and reportedly threatened Gulf officials by saying they "can all go to hell" if support is withheld. Arab leaders meeting Wednesday in Davos – including the King of Jordan and Saudi Arabia's foreign affairs minister – suggested that it is possible to renew peace negotiations despite President Trump's Jerusalem declaration, the Jerusalem Post reports, citing a Maariv report. This is yet another setback for Abbas, who seems to think his personal vendetta serves Palestinian interests. As Grant Rumley, research fellow at the Foundation for Defense of Democracies and expert on Palestinian politics, argued this week, Abbas has "morphed into a bureaucratic tyrant at home, hostile to America and downright incendiary towards Israel" and that his reign "alienated his people leaving them disillusioned and disenfranchised."